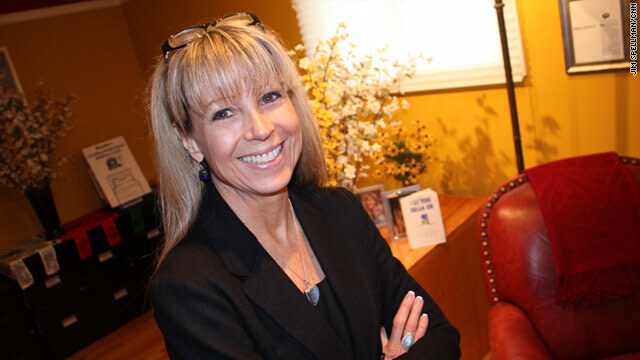 Sue Frederick, a psychic, advises clients on their career path. She charges $250 an hour and is booked for the next six months. Longmont, Colorado (CNN) -- Sue Frederick says she can see your dream job and is ready to help you find it. Unlike traditional career counselors, Frederick uses her "intuition" to help her clients. "I've been called a clairvoyant and a medium because my skills fit those skills," says Frederick. "You have all the answers you need inside of you and all the gifts you need to make it happen." What she does is much more than just gazing into a crystal ball or reading someone's palm. "I help people first see the big picture, then I bring it down to the concrete baby steps," she says. "Everyone needs to have a baby step action plan, or they are paralyzed ... so we break it down." Here's how it works: Clients who are usually in some sort of job crisis, laid off or unhappy with their work, get in touch with Frederick, usually by phone, and give her their date of birth. "If you take your date of birth and digit it down to a single number, you come up with the energy of what you have come to be in the world through your path, your work," she says. "I help people see what that means in their life." Next, Frederick meditates about the client's case and says she has visions of the right career move for her clients. "I see images and pictures of people doing their great work in the world," she says. At this point, many people roll their eyes and write Frederick off -- but she says a better job and a better life await those willing to make the leap. "The first step is to understand more about your soul's mission," she says. "There's always a deeper story when people are unhappy with their job or they are afraid -- it's time for a reinvention point." It's at that point, she says, that people are willing to "pull back and look at the bigger picture of their life." These reinvention points, according to Frederick, come as part of nine-year cycles. She uses numerology to pinpoint where her clients are on those cycles and when it's time to change she helps people move in a more fulfilling direction. "The next step in everyone's career journey is to a higher expression of their gifts and what they've come to do in this world," she says. "So it becomes more meaningful work, more financially successful, more fulfilling in that they think they are bringing more of their true self to the world through their work. " But she emphasizes that this doesn't mean taking a vow of poverty to teach yoga or live on an ashram. "Here's the myth: We're told that either we can pick work that we love and be poor and starve or we can have the job we take for benefits and security and be unhappy," she says. "We're told that those are our two choices, and that's not true at all." Frederick, 59, made her own career change a decade ago. She says she has been aware of her psychic powers since she was a little girl but was reluctant to share them. After a career as a journalist and magazine editor, she decided to become a career counselor and use her intuition. She has worked with thousands of clients who pay $250 for a one-hour session with her, usually over the phone. This economy means people who have been unhappy with their job ... finally get the opportunity to reinvent. She shares a large house outside of Boulder, Colorado, with her husband and teenage kids. Statues of the Hindu god Ganesh mingle effortlessly with baseball gear and running shoes. Frederick -- who also hosts seminars and has written a book, "I See Your Dream Job" -- says she is booked six months in advance. She says that while the current economic downturn is difficult in the short term, it is presenting people with the opportunity to change and find a better career and a better, more fulfilling life. "This economy means people who have been unhappy with their job but just took it for the benefits and the paycheck are finally getting shaken out of those jobs," she says. "Now they finally get the opportunity to reinvent. "Now when you laid off and can't get a job in your old path, you finally get to go, 'OK, maybe I can take a baby step in a new direction.'" "When we pick a career from our passion, from our soul's work, then that always brings us to true abundance no matter how strange or unique or unusual that work may be." The rules of the game have changed. Career experts tell us what it takes to get hired in a post-recession job market. The brutal job market has been hard on everyone, but especially on the youngest members of the labor force. Lots of companies claim to encourage work-life balance, but how can you tell which ones actually mean what they say? What separates the great from the good and makes a particular candidate too irresistible to pass up? In some of the world's most esteemed restaurants, there's a silent workforce. Meet the stagiaire: an apprentice in the craft of cooking. It's all in who you know. What can you do when you've exhausted your inner circle and still don't have a job? These Fortune 100 employers have at least 350 openings each. We asked company representatives the secrets to getting hired. If you haven't already had an important meeting -- like a job interview -- on Skype, chances are that you will.